You GUYS! It's CAS-ual Fridays Stamps release week and I am SO excited about the stamps and dies I get to share with you this week! For reals! They are absolutely AWESOME and you are going to love them! We are starting out today with the brand new Autumn Blessings stamp set and Acorn Fri-Dies. You can see the full set and dies over on the CAS-ual Fridays Stamps blog. You guys, for reals, this is a fantastic, versatile fall stamp set that I know I will be reaching for all year for various projects. It just rocks! I went with a simple design for this one. I stamped and colored the acorn with Spectrum Noir colored pencils and then die cut the top piece only to add some dimension. I am absolutely IN LOVE with the tiny stamps in this set. Yes, of course the big ones are fabulous, but that tiny acorn is TOO CUTE! And there are a couple of tiny leaves, too! They are perfect accent stamps! LOVE IT! A bit of May Arts twine finishes off the acorn perfectly. Also, I used pumpkin pie ink for the sentiment. Because pumpkin everything. Now, leave a comment here and then head on over to the CAS-ual Fridays Stamps blog to check out this full set and to find out how YOU can win a $25 Gift Certificate to the CAS-ual Fridays Stamps Store! Woot! Woot! Love your cas autumn design!! Beautiful!! That's so simple and so cute!! I love it! So pretty. Love how you die cut the acorn cap, and gave it some dimension. I also really like the pumpkin pie ink used on the sentiment. Goes great with your acorn. Thank you for sharing. Oh yes, the tiny stamps are adorbs! Great card! This is so cute!! I love the texture with the twine! So clever! 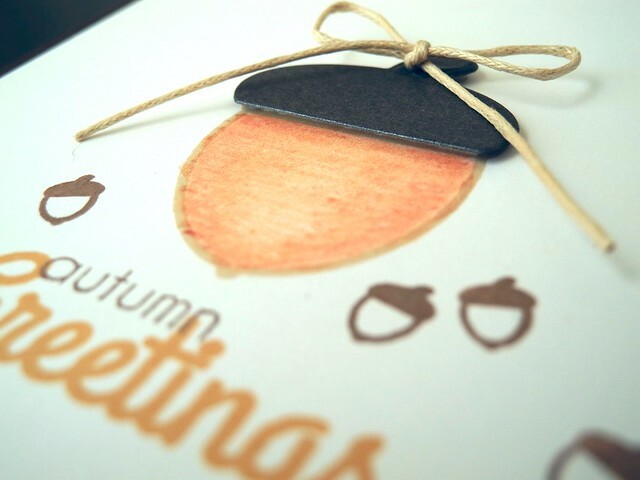 What a super fun autumn card! I just love acorns during the fall season. Your card is super-cute! You card is so fabulous! The acorn is perfect!